2008 might in some modest way take its place alongside the epoch-making Council of Jerusalem, recorded in Acts chapter 15. For in both events there were issues being dealt with, that were to influence the direction of the church – and affect the spiritual destinies of vast numbers of people. to Poverty – these going hand in hand with workshop sessions and group Bible studies. It was an intensive programme; yet the whole event was termed a ‘Pilgrimage.’ Many of those attending had never been to Jerusalem, and the take-up on Pilgrimage excursions was considerable, these providing fresh opportunities for open-air worship and fellowship, in blazing sunshine. But as worthwhile as anything else was the opportunity to meet with fellow-leaders, many of whom were in situations of extreme testing. about? 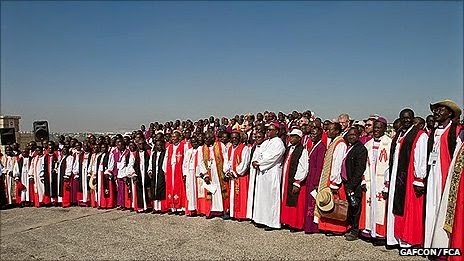 It was an international holding of hands by an army of determined Christian leaders in the face of a group of western anglicans who are challenging ‘the faith once delivered to the saints’ (Jude 3)….and so are haemorrhaging precious members and local churches week by week. 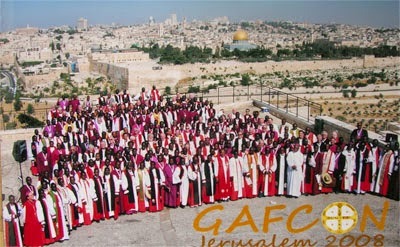 If you want to read the final statement of THE JERUSALEM DECLARATION – which started with a blank sheet of paper, was discussed at every level and finally received by unanimous acclamation amid cries and tears of joy – click ontowww.anglican-mainstream.net and read it for yourself. I believe that Archbishop Cranmer himself would have endorsed it. It is not just a question of words – for there are numbers of church leaders who will cheerfully sign up to the Creeds and 39 Articles of Religion at the back of the old Prayer Book, but who – by a process of hermeneutical gymnastics - will make the plainest statement of Scripture mean something different. It is an insult to the original writers of sacred documents. Would you think of adding your own name to the signatories of The Jerusalem Declaration? Click to the Anglican Mainstream site, and you will find a facility by which YOU can sign – and join an army of joyful pilgrims!